Walk out into wonder. Walk out expectant. Get lost in a sea of color, be ushered into art by Joy. 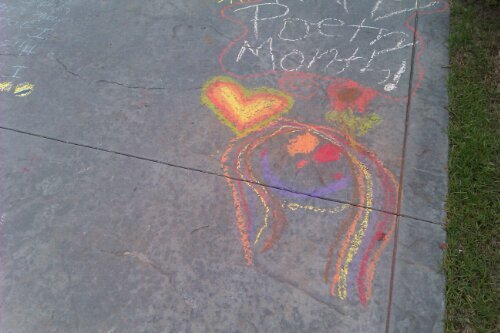 Meet hunched over concrete artists, poets bent over in an ocean of chalky words painted in child style. Authors of brilliant color, brilliant meaning. Wisdom written, published immediately on rocky tablet, all Old Testament. Simple, plain, proclamations from child heart, child truth. Lips bitten, knuckles white, pressing hard, bracing wind and the elements. Because the Words need a voice and a place. Because their hearts have a story to tell. You zig and zag around theirs as you do yours, the stories. Take care not to step on these yellow lines with pink prose and hard written lines on rough gritty. Like ours, theirs want to spring out into April air and be told, to dodge the rain drops and lay there sundrenched long enough to be heard. Find Joy in the sunlight, find Joy in the telling. 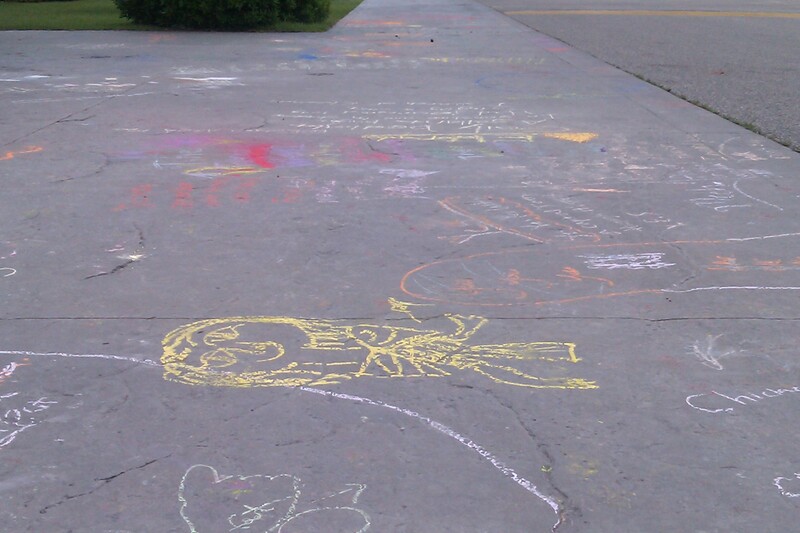 Sidewalk artists for the day, delight in the hope of eyes seeing creativity at their feet. Careful to step big and step over the masterpiece after naming it “very good”. Where is childlike wonder in your words? How did childlike wonder go all black and white, shackled up and bound inside the lines. When did the palete lose its chalky choices once full of pastel poetry and prose? When did the mundane monochromatic get to be enough. When did we settle for the uninspiring. Stop looking for the beautiful. 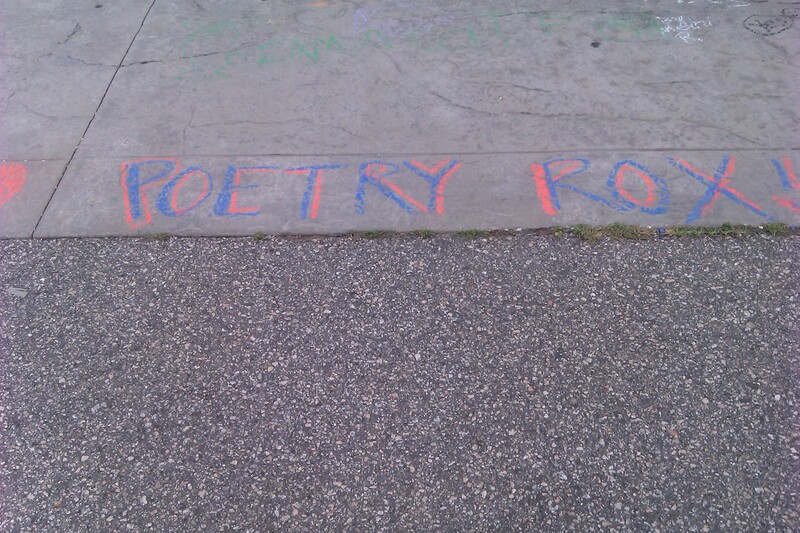 Sidewalk poetry inspires. Calls to come write and play and tell a bumpy concete story. Color it joyful, color it bright, color it sideways. Color your story on the hard path, knelling and bent down with your dusty fingers and your windblown mane. 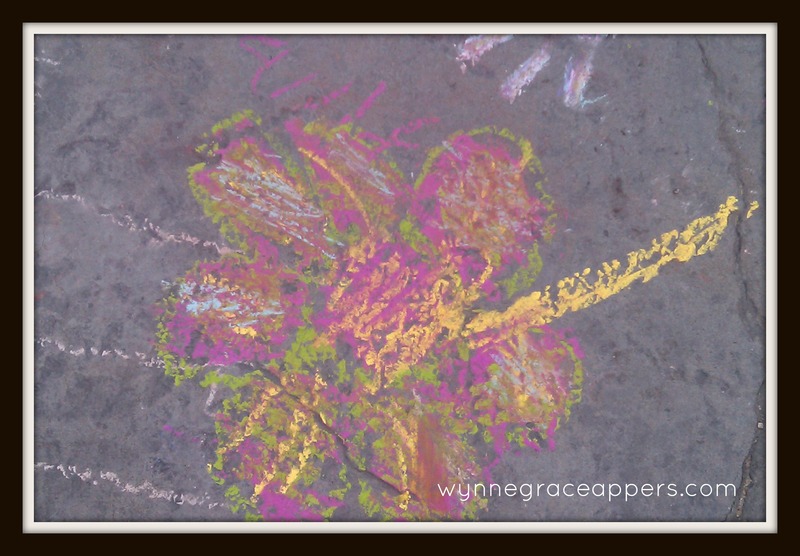 Lay down your story all gritty and real with your colored chalk. Write it bigger than big cause you’re all outdoors and free to be big sideways and be loud big. Write like the child you are, the child of God. 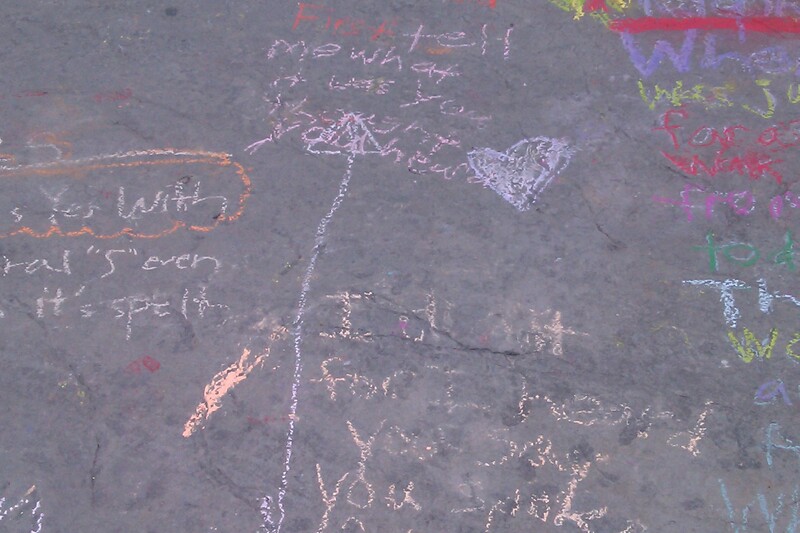 Tell it poetic, tell it all chalky and dusty, all kneeled down child’s pose. 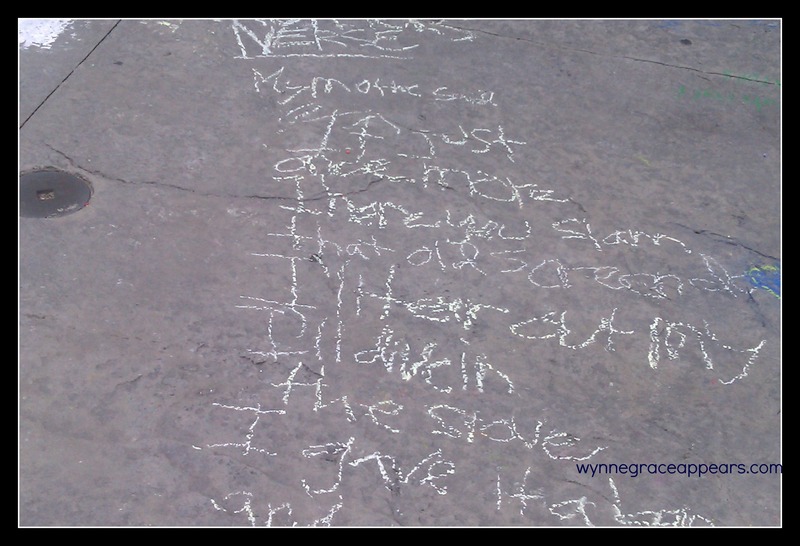 And let the sidewalk lower school poets inspire you to freely write it down, lay it down, smack down at the entrance and exit of the middle of the everything. Let Joy in the Art blow words of sweet beauty, sweet blessing. And let the sweet and the simple be Art for today. Art that inspires all the growing-up people. Words that halt the hearts, and the steps, and the pace of the too fast people. Words that say stop, there’s a story that wants to be heard on the concrete path on the right in front of your big growing-up feet. Stop and read and be inspired, before the rain washes them all away. Beautiful poetry! Almost more colorful than physical art itself. Poetry can so free, with fewer boundaries than does physical art. 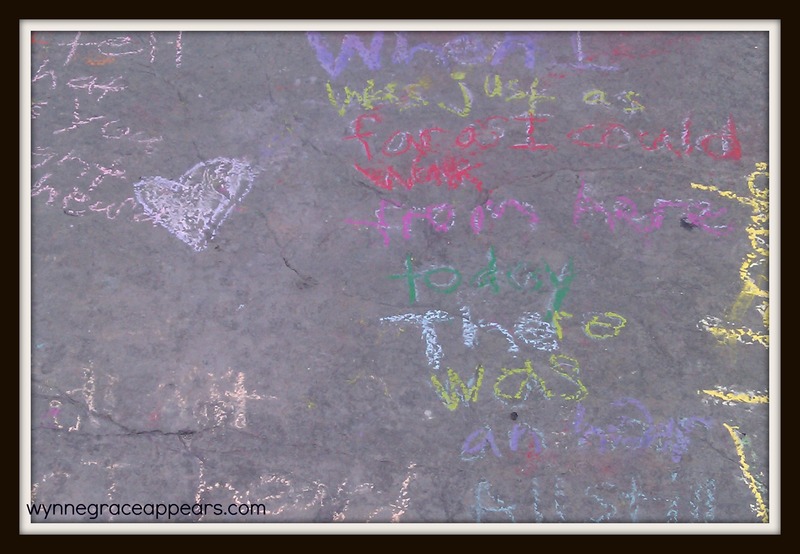 I love using chalk to tell stories. I was fortunate enough to go through a chalk art ministry course. It is a special thing to be able to draw while sharing from your heart! Thanks for being here with such sweet and beautiful words of support and insight. So Grateful to have you stopping by and taking the time to leave kind words. I love it! I’m going to be at Pawleys during the first 2 weeks of July. We should grab coffee or something! Thanks for stopping over!! Great to have you. I am on facebook finally now so would love to have you follow me on my blog facebook page. And yippee can’t wait to get together when you come to Pawleys this summer. Keep me posted as we get closer. Blessings and your god-son is precious.